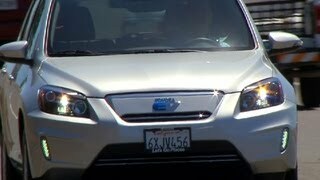 During this year's Electric Vehicle Symposium in Los Angeles, Toyota revealed their full-electric crossover developed partly with the support of Tesla Motors. 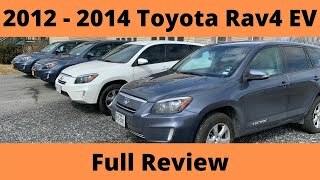 Besides the electric drive, the new Toyota Rav4 EV 2013 has also undergone changes in terms of exterior design in order to easily differentiate itself from its gas-powered sibling. At the heart of the Rav4 EV beats a 115 kW (154 horsepower) electric drive system coupled with a battery pack provided by Tesla Motors. In Sport mode, the setup is capable of delivering a top speed of 100 mph and can accelerate the crossover from 0 to 60 in 7 seconds. There is also a "Normal" mode which reduces the top speed to about 85 mph and adds 1.6 seconds to the acceleration. Although Toyota has not revealed any exact official numbers, the manufacturer claims the Rav4 EV is able to cover around 100 miles on a single charge, whilst recharging should take roughly 6 hours with a 240V/10A charger. The battery pack has been fitted in the low-center of the car, thus the cabin space has not been compromised and due to the low center of gravity the Rav4 EV handles quite well in the corners. To differentiate itself from the gas-powered sibling, the exterior of the EV has been fitted with redesigned front bumper, side spoiler, upper and lower grille and side mirrors. Both the headlights and taillights have been replaced with LED units, and the underbody of theRav4 EV has also been replaced with a new one in order to improve air flow. In terms of exterior colors, the new Toyota EV comes in Blizzard White Pear, Classic Silver metallic and Shoreline Blue Pearl. 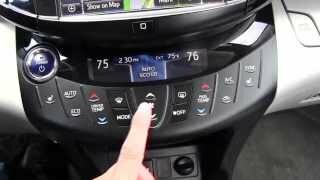 On the interior the Rav4 EV features what Toyota calls "Neutron" fabric on the seats and door trim, and tech-wise the interior benefits from an 8-inch capacitive touchscreen offering telemetrics, navigation as well as EV drive information and settings. Furthermore, the infotainment system offers Entune, Bluetooth connectivity, USB port with iPod connectivity and SiriusXM Satellite Radio. Another interesting feature that we've seen before in all-electric vehicles is that the dashboard display color changes red when driving in Sport mode, whilst the Normal mode has been associated with the color blue. 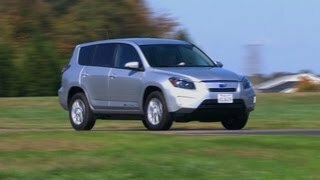 Availability wise, the Rav4 EV is expected to hit the US market in select dealers starting this summer, at the price of $50,610, and production wise Toyota expects to sell 2,600 units during the next three years. 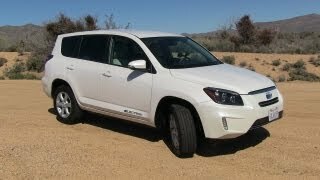 In case the Toyota Rav4 EV 2013 is not exactly what you're looking for in an all-electric SUV, you might have to wait until 2014 for the Tesla Model X EV SUV, which boasts higher performances, more features and of course a higher price than the Rav4 EV.